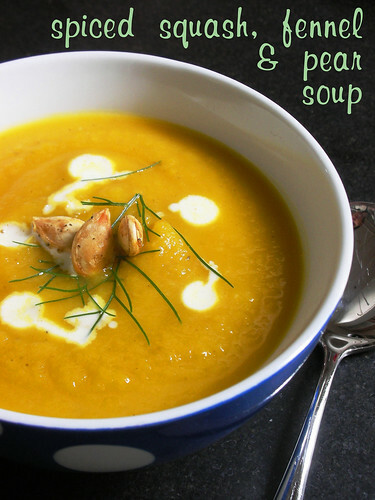 Spiced Squash, Fennel and Pear Soup for a Celebration! Today is a special day for one of my favorite cookbook authors…it’s Dorie Greenspan’s birthday! Happy birthday, Dorie! A few TWDers and FFWDers have put together a sort of virtual progressive dinner party, all made from Dorie’s new book, Around my French Table, to celebrate. I chose to take on a soup course, and made her Spiced Squash, Fennel and Pear Soup. I’m no stranger to squash soup, and usually I’ll use a butternut, but a crazy lumpy, bumpy golden hubbard caught my eye at the market and wound up coming home with me. I’ve never made squash soup with the additions of pear and fennel before…they brought a delicious sweetness to the pot. Don’t forget to toast up your squash seeds as garnish. 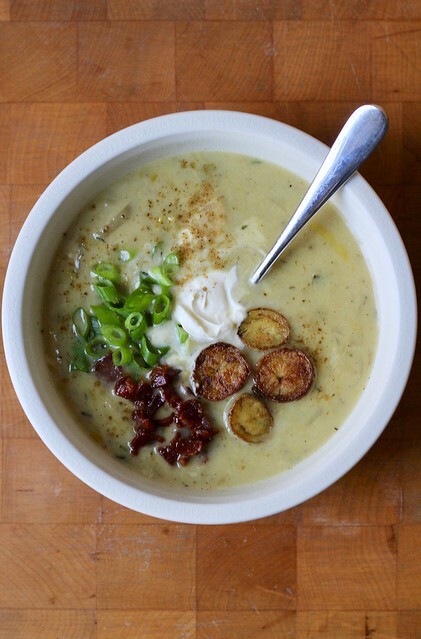 This is a great, warming soup that gets even more flavorful the next day. 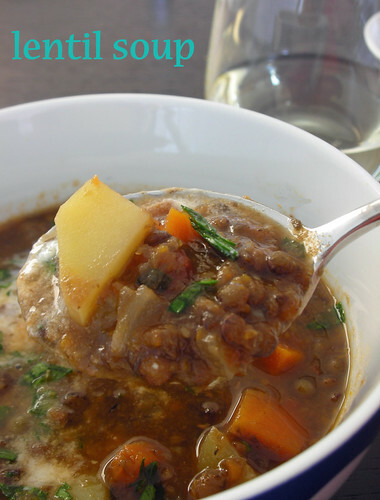 For the recipe for this delicious soup, see page 80 of Around my French Table by Dorie Greenspan. Holly from Phe.MOM.enon worked hard to coordinate this party, and will have the whole round-up on her site! I may have skipped last week’s French Fridays with Dorie, but there was no way I was going to skip this week’s. 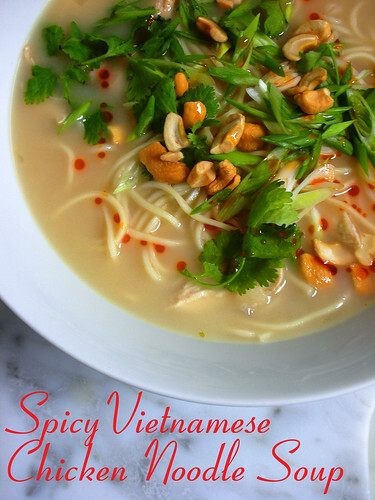 I crave soup went the weather gets cool, and this Spicy Vietnamese Chicken Noodle Soup is full of flavors I love– chiles, cilantro and coconut. There’s a lot of flavor packed into this coconut broth, as it’s infused with ginger, cilantro stems or root, coriander, star anise and peppercorns. I threw in some lime leaves and a bashed lemongrass stalk, too. I went heavy on the lime juice and fish sauce to give it extra twang. This is the kind of soup where, when you’re almost to the bottom, you set down your spoon and pick up the bowl to slurp up the rest of the broth and noodles. Oh, and by the way, my friend Lauren and I went to one of Dorie’s book events in NYC the other night. She’s so warm and she’s truly happy to meet us. If she’s on the road near you, don’t miss her! And she’s funny, too…if this cookbook thing doesn’t work out for her (ha! ), there might be a career in stand-up waiting. It’s been awhile, but Allen from Eating Out Loud is back with another Food Fight, and this time it’s a pantry raid. That phrase makes me giggle in a juvenile sort of way…one of the lingering side effects of having seen Revenge of the Nerds a few too many times. My pantry isn’t super-well stocked. I don’t have a huge family..it’s just my husband and me (and I guess now my brother since he’s been “visiting” for four months! ), and several nights a week I am working at the restaurant and not home to make dinner. I tend to do my shopping on an as needed basis so I don’t have too much junk lying around. Poking through what I do have in the pantry the other day, I was wondering how I could combine Craisins, wild rice, peanut butter and golden syrup into something delicious. Perhaps I could encase them in that puff pastry that’s been in the freezer for several months. Yeah, maybe not. Then I discovered something I’d forgotten about…a bag of lentils. Rather than concoct something potentially disgusting, I decided to go with a classic lentil soup that I could easily put together with things I had already. I’d say this particular pot of soup fit the definition of a pantry raid. It was made only from items I already had in the pantry and fridge (and wine rack). I didn’t go to the store to get any additional ingredients for it, and nothing was bought in advance with the intention of making lentil soup with it. I used a recipe that I’d made once before from my most favorite cooking magazine, Cook’s Illustrated. I modified it slightly to use up what I had at home…dried thyme instead of fresh, a chicken chorizo sausage instead of bacon. (The other time I made this recipe, I turned it into a vegetarian soup by sauteing my veggies in olive oil rather than rendered fat.) I had a few small new potatoes hanging around from the previous week…there weren’t enough of them to do anything else with, so they went into the pot, too. The chicken chorizo gave it a wonderful smoky flavor that we all loved. Even my brother, who was quite suspicious of lentil soup, asked for seconds! Allen asked us to also include a photo of our pantries. How personal! I bet you aren’t going to get any organizational tips from mine–what’s in there is a total mess! 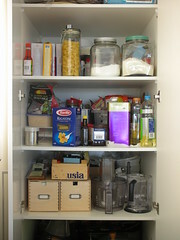 This photo is of a large pantry closet in the kitchen. I have a few shelves dedicated to food items and the others are for cake pans, the salad spinner, etc. Stuff is kind of all over the place, but I could close my eyes and still be able to pull out exactly what I need when I need it–sort of an organized chaos, I guess. I also have a smaller cupboard with my expansive vinegar collection, honey, jams and stuff like that. Note: Instead of chorizo, you can use 3 slices bacon (about 3 ounces), cut into 1/4-inch pieces, or for a vegetarian version, use olive oil. -Fry chorizo in large stockpot or Dutch oven over medium-high heat, stirring occasionally, until fat is rendered and chorizo crisps on the outside, 3 to 4 minutes. Transfer chorizo to a paper towel-lined plate to drain. Leave the rendered fat in the pan (although you can pour some off if it is excessive). Add onion and carrots; cook, stirring occasionally, until vegetables begin to soften, about 2 minutes. Add garlic and cook until fragrant, about 30 seconds. Stir in tomatoes, bay leaf, and thyme; cook until fragrant, about 30 seconds. Stir in lentils, salt, and pepper to taste; cover, reduce heat to medium-low, and cook until vegetables are softened and lentils have darkened, 8 to 10 minutes. 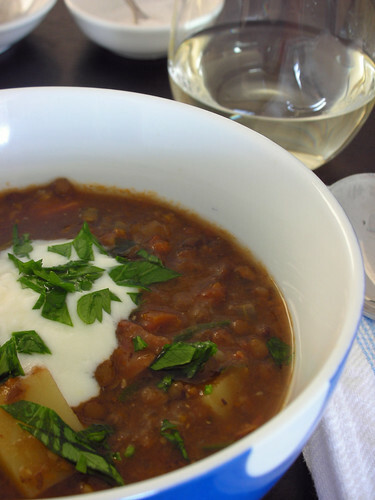 Uncover, increase heat to high, add wine, and bring to simmer. Add chicken broth and water; bring to boil, cover partially, and reduce heat to low. Simmer for about 20 minutes, then add in the diced potatoes. Continue to simmer until lentils are tender but still hold their shape and potatoes are cooked, about 10 to 15 minutes more. -Discard bay leaf and puree 3 cups soup in blender until smooth, then return to pot; stir in vinegar, add the chorizo back to the pot and heat soup over medium-low until hot, about 5 minutes. Stir in 2 tablespoons parsley and serve, garnishing each bowl with some of remaining parsley and sour cream or yogurt, if desired.